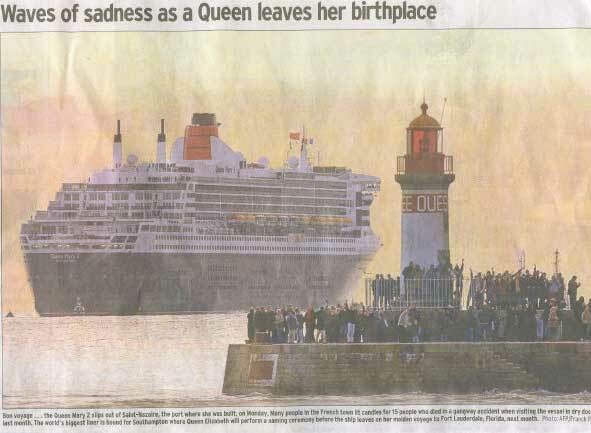 The biggest luxury liner in the world had only successfully carried out her sea trials off Brittany last week. This giant ship being built at a cost of $ US 800 Million, for Carnival Corp's Cunard Line by the French heavy engineering company, Alstrom at its Chantiers de l'Atlantic shipyard, when last weekend 40 friends and family members of shipyard workers were crossing a gangway to board the ship for a visit when it collapsed under their feet. They all plunged about 25 meters to the ground, killing 15, and seriously injuring another 9. Near the ship, an emergency hospital was set up, and 50 vehicles and a helicopter were needed to move all those involved in this accident. Both the French President Jacques Chirac, and the Prime Minister Jean - Pierre Raffarin will visit the site. 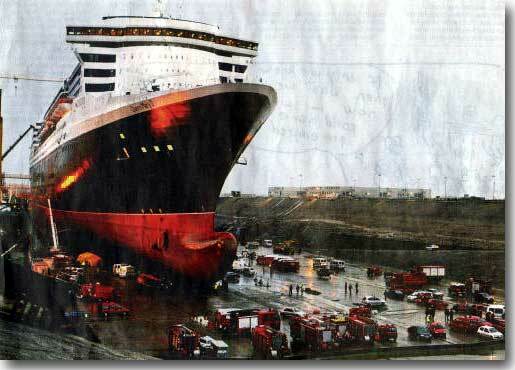 Queen Elizabeth is scheduled to launch the Queen Mary 2 for its maiden voyage on January 12th. 2004.